If I’m not sure what to make for dinner and I go to the store to figure it out, when I see mussels for sale I know the answer. I find them so versatile and easy. We’ve made mussels a few times already for French Fridays with Dorie: mussels with chorizo in February 2012 and, more recently, moules marinière in January 2014. Sometimes Costco has 5 pound bags for sale at 99 cents a pound. Who can pass that up? Not me. Back in the September/October 2013 issue of Cook’s Illustrated, they had a recipe with several different flavor variations for steaming the mussels in the oven. I’ve tried a few of those, and they are excellent. I’d give you the link, but Cook’s Illustrated doesn’t share their recipes on-line. If you subscribe, check your back issues, or email me and I’ll send you a copy of the recipe. I don’t know that I’ve ever made the exact same recipe twice. I do know that I typically use Mediterranean flavors, with or without tomatoes, always with garlic, herbs, and wine. I’ve also tried mussels with hard cider, which also falls in the European camp. The jump to Southeast Asian with curry powder was new territory for me with mussels. Even with the seasoning relocation, this was as easy as other recipes I’ve made. Onions and shallots are sautéed in butter. Spices are added, and the heat allows the curry powder flavors to bloom. Finally, wine and herbs go into the pot to make the base of the sauce. Time to add to the mussels. This time, I picked up Maine mussels at Whole Foods. They were pretty clean, so the effort to sort, scrub and debeard was minimal. After just three minutes, they were gaping open. To finish, the mussels are scooped out of the pot and set aside while heavy cream is added and boiled for a few minutes to reduce the sauce. I wasn’t paying close attention to the recipe and skipped the step to boil the sauce for a few minutes before adding the cream. It seemed fine without it. 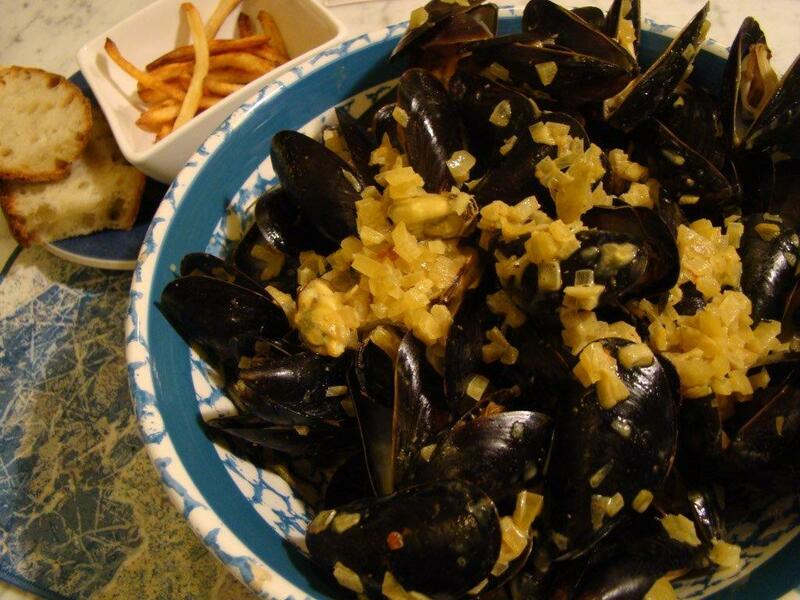 Dorie recommends serving the curried mussels with bread or French fries. I served with both: French fries for munching and bread for dipping. Dorie also insists that the mussels are eaten piping hot and with your fingers. I followed her instructions, but have to admit that the sauce kept flying out of the shells, onto me. I had to do laundry when I was finished with dinner. Did anyone else have that problem? Howard isn’t wild about the taste of curry, but he was away for a few days, so I made a half of the recipe for myself. I really enjoyed it. 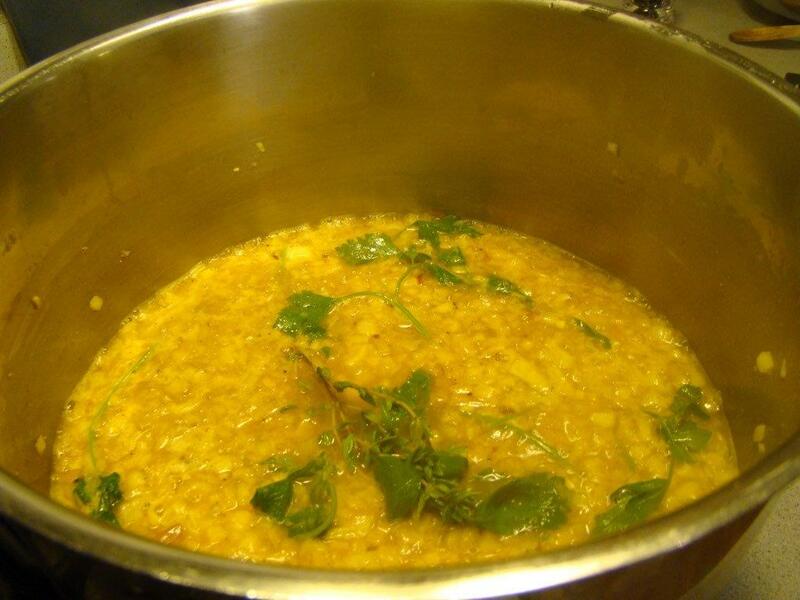 The curry powder gave an exotic twist while the cream and shallots kept a tie to Europe. Soaking up the sauce with bread was the way to go. I bought a bag of frozen French fries, just like my mom used to make to go with Mrs. Paul’s fish sticks, though mine were organic. I was shopping at Whole Foods, after all. The fries didn’t stay hot for very long once they came out of the oven. Maybe my house is too cold. I think perhaps French fries are better as restaurant food. There were plenty of mussels leftover. I plucked from the shells and stored them in the sauce. The reheated mussels were delicious served over jasmine rice and steamed carrots with chopped scallions sprinkled on top. Didn’t I tell you that mussels are versatile? Next week, I’ll share photos of my next Dorista meetup: breakfast with Tricia of Tricia and Nana Cooking with Dorie and our husbands, happening tomorrow morning! 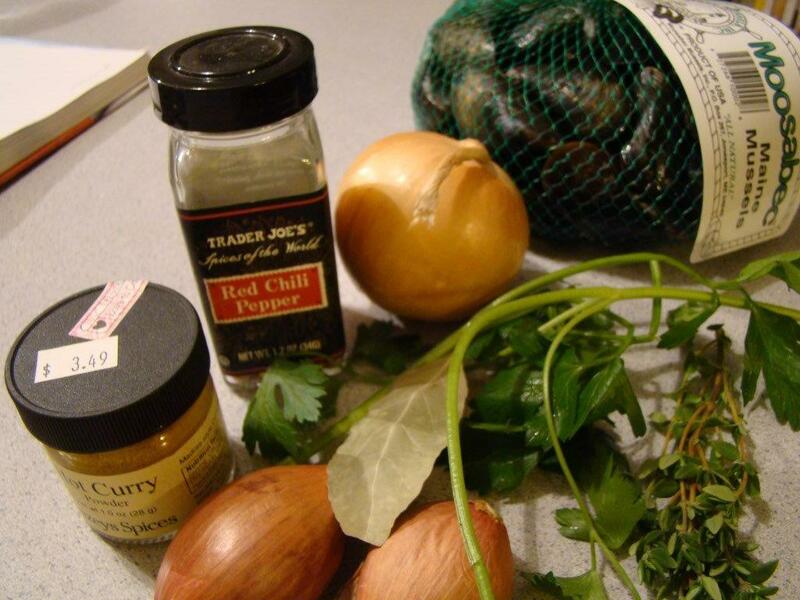 Posted on 16 January 2015, in French Fridays with Dorie and tagged French Fridays with Dorie, mussels. Bookmark the permalink. 16 Comments. Hi Betsy, these look delicious, happy you enjoyed them. 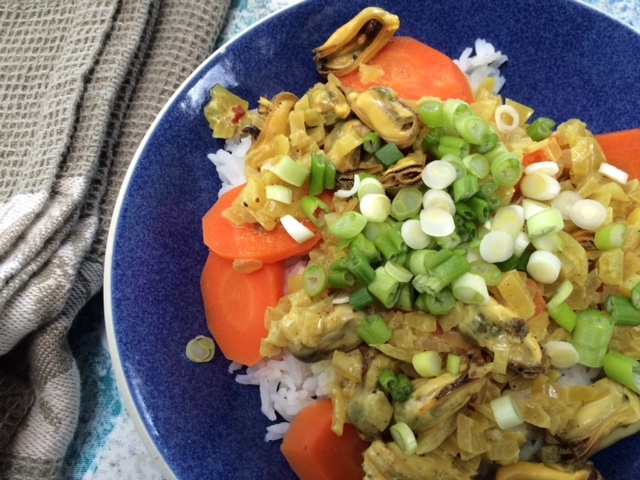 I make a curried mussels dish using curry paste and coconut milk, darn good too, bet you would like it. Have a great weekend! I’ll bet I’d like it too. I was thinking that it would be good with coconut milk instead of cream another time. I like the idea of curry paste too. Wow, I’ve never thought of leftover mussels. I’ll have to email you for the recipes to Cook’s Illustrated, sounds like a terrific source! Love both your curried mussels dishes; I never have enough mussels leftover! Looks great, Betsy! You know, I did homemade fries and was also disappointed at them not being hot after a very short time. I think it’s because I oven baked them. Maybe there’s something about the fryer that makes them stay hotter? Glad you enjoyed it! Dear Betsy, so nice to read (and see) that you had the pleasure of meeting up with Tricia – that must have been wonderful and I am very happy for the both of you! And how nice to see that you enjoyed these mussels and made a wonderful Asian-inspired dish the next day with the left-over mussels – no such luck here, no left-overs. This was a wonderful recipe and I could not agree with you more as far as the versatility of the mussels is concerned! Wow, 5 pounds for 99 cents – a bargain! Two and a half pounds were $10 here. I am glad that you got to enjoy this as a special treat just for you. I loved it. If I found mussels for 99 cents a pound I might force Gary to eat them:) Whole Foods price was quite a bit more than that but still cheaper than the peeled and deveined shrimp I bought there. I agree with you about french fries. They are never as good at home. I’ve been wondering about the air fryers I’m seeing at Williams Sonoma lately. I wonder how fries do in that type of cooker. I’m glad you enjoyed your mussels Betsy! The look delicious. Hmmm we didn’t have much sauce so there was no laundry for me to do, fortunately! I’m drooling over everyone’s french fries. Cold or not, they look delicious, but I can rarely be convinced to make them at home. This was a new taste combination for me as well and I absolutely loved it. I’m curious about the oven steamed mussels. I think I should still have access to Cook’s Illustrated so I’ll go look it up. What a fun breakfast! I’m looking forward to seeing your photos. Every time I read a post like this I think I need to try harder to learn to like mussels. They are cheap, convenient, and healthy, and I do love the sauce that they make. I made the curry sauce with shrimp and scallops instead. We really enjoyed it. A few items, Betsy. First, what’s the deal with you hating catchup? How do you eat scrambled eggs without it? And, raw carrots. A hamburger? Meatloaf? C’mon. When I come next Fall should I bring my own bottle? I suspect you don’t even have a dusty bottle stored in the basement. Well, enough about that. I’ve never seen 99 cents a pound mussels at Costco but I just cannot shop there anymore. I have to buy to much food for just me. Do you think Howard would have liked this curry? I didn’t think it had a very strong curry taste, just good flavor, so he might have enjoyed trying it. Like your leftover mussels with rice dish. I don’t make enough rice as a side or to use in a main course. Wonder how it would taste with catchup. Nice Post, Betsy. Everyone seems to really enjoy this recipe. I am going to make it with shrimp, which I should have thought of before but I am enjoying my make-up recipes. Have a great week and look forward to your next post. I think I’d like to try all those mussels many ways. P.S Thanks for the link to the article – that was a great read. It’s been a revelation to me how quick and easy mussels are to cook. I really loved this recipe. Your leftovers meal looks great!